Why so much emphasis on keeping customers happy? Because, says Martin, while people do business with hotels, airlines and car-rental firms because they must, they take a cruise only because they want to. ���There���s an extraordinary focus from us on high customer satisfaction,��� he adds. ���Otherwise, we���ll get passed over for another company.��� Keeping ���Em Rolling Some IT transformations are closely linked to specific business initiatives. That���s the case at Trans Eurokars Pte. Ltd., the largest privately held car distributorship in Singapore and Indonesia. The company���s 650 employees manage the distribution of Porsche, Rolls-Royce, Mini, BMW (only in Indonesia), Mazda and 3M car products (national distributor in Indonesia). It had set a goal of expanding into new Asian regions. To achieve that goal, the company would need a transformation of its IT infrastructure. Why? Because the IT systems at Trans Eurokars had only limited financial and technical resources, the company needed to greatly improve its scalability, availability and reliability to support growth into new markets. IT also needed a reliable disaster-recovery system, one that was robust enough to protect these systems. For help, Francis Lim, Trans Eurokars��� Group IT Manager, enlisted Tak System Integration (TSI), a Singapore-based service provider. TSI, in turn, deployed innovative cloud-based and data protection tools. Initially, Steven Tan, Sales Director at TSI, met with CA Technologies to discuss developing a private cloud system and a more reliable data-backup approach for Trans Eurokars. After a three-month testing period, Tan recounts, ���We had a strong conviction that the CA AppLogic�� cloud computing platform was very comprehensive in terms of providing the flexibility and scalability we needed for the project.��� TSI also built a powerful disaster-recovery system for the auto distributorship by deploying CA ARCserve��, a high-performance backup solution, at its core. Now, if an infrastructure failure occurs at Trans Eurokars, the entire IT architecture switches over to a secondary data center on the company���s private cloud, thereby avoiding disruptions to critical business functions. With all these systems in place, Trans Eurokars has freed up more than 100 hours of IT labor per month ��� and will cut hardware costs by 20 percent over the next two years. Also, the company did achieve its business goal, expanding beyond Singapore. ���My ultimate transformation objective,��� says Lim, ���was to bring my company to another level of exposure [in the marketplace]. Now, with our more efficient and flexible environment, we���re able to do that.��� For more, read ���Five Tips for Transforming Your IT Infrastructure��� on Smart Enterprise Exchange. Knowing Now Sicredi is one of Brazil���s largest cooperative credit systems, with over $2 billion in assets, more than one thousand offices and some 2.2 million members. But to continue offering the convenient and reliable banking experience that customers demand, Juliano Murlick, CTO of the Porto Alegre-based company, knew his IT division had big challenges to address. ���We���re in the middle of an IT transformation that we planned three years ago, and for which we have a strategic plan to guide us over the next five,��� Murlick says. Sicredi IT worked with CA Technologies on a new, consolidated management platform. Today, Sicredi���s IT staffers can oversee the firm���s IT infrastructure and services in a highly visible and simplified manner, and they can quickly root out system problems for repair. Sicredi IT staff can also understand the infrastructure���s impact on business services ��� then work proactively to avoid any interruptions. For end users, this brings big benefits. 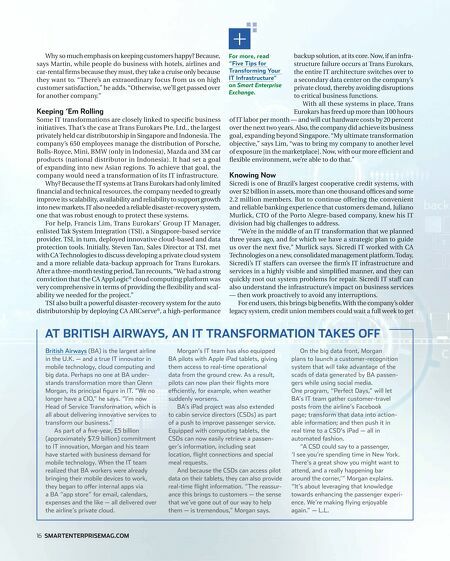 With the company���s older legacy system, credit union members could wait a full week to get At British Airways, an IT Transformation Takes Off British Airways (BA) is the largest airline in the U.K. ��� and a true IT innovator in mobile technology, cloud computing and big data. Perhaps no one at BA understands transformation more than Glenn Morgan, its principal figure in IT. ���We no longer have a CIO,��� he says. 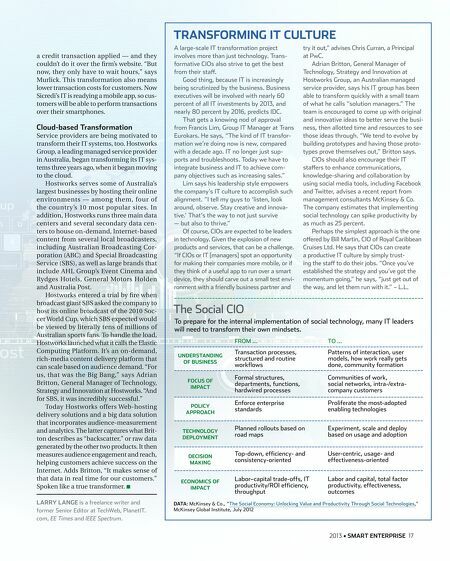 ���I���m now Head of Service Transformation, which is all about delivering innovative services to transform our business.��� As part of a five-year, ��5 billion (approximately $7.9 billion) commitment to IT innovation, Morgan and his team have started with business demand for mobile technology. When the IT team realized that BA workers were already bringing their mobile devices to work, they began to offer internal apps via a BA ���app store��� for email, calendars, expenses and the like ��� all delivered over the airline���s private cloud. 16 smartenterprisemag.com Morgan���s IT team has also equipped BA pilots with Apple iPad tablets, giving them access to real-time operational data from the ground crew. As a result, pilots can now plan their flights more efficiently, for example, when weather suddenly worsens. BA���s iPad project was also extended to cabin service directors (CSDs) as part of a push to improve passenger service. Equipped with computing tablets, the CSDs can now easily retrieve a passenger���s information, including seat location, flight connections and special meal requests. And because the CSDs can access pilot data on their tablets, they can also provide real-time flight information. ���The reassurance this brings to customers ��� the sense that we���ve gone out of our way to help them ��� is tremendous,��� Morgan says. On the big data front, Morgan plans to launch a customer-recognition system that will take advantage of the scads of data generated by BA passengers while using social media. One program, ���Perfect Days,��� will let BA���s IT team gather customer-travel posts from the airline���s Facebook page; transform that data into actionable information; and then push it in real time to a CSD���s iPad ��� all in automated fashion. ���A CSD could say to a passenger, ���I see you���re spending time in New York. There���s a great show you might want to attend, and a really happening bar around the corner,������ Morgan explains. ���It���s about leveraging that knowledge towards enhancing the passenger experience. We���re making flying enjoyable again.��� ��� L.L.